CALGARY — B.C. Lions coach Wally Buono dusted off a 33-year-old boxing match to inspire his players. The Lions watched "Marvelous" Marvin Hagler beat Thomas "The Hitman" Hearns in a middleweight title fight from April 15, 1985, prior to outlasting the host Calgary Stampeders 26-21 on Saturday at McMahon Stadium. "Part of that was to show the players how two great champions come together and how they have to be able to deal with the good and the bad," Buono explained. "There's going to be a time when you're going to want to quit. There's going to be a time when you're going to feel like you're beaten. At the time when it's most desperate, you can't give up." "Exactly as the fight was, the game was. The players can understand how brutal sports is, but you've got to be willing to take the hit." Calgary lost at home for the first time this season, but still tops the CFL's West Division at 12-3 and has secured a playoff game at McMahon. The Lions (8-7) have won five of their last six games and improved to 2-6 on the road. A Saskatchewan Roughriders loss to the Winnipeg Blue Bombers earlier Saturday had opened the door for the Stampeders to lock down first in the division with a win or a tie versus the Lions. But the three playoff spots in the West and the cross-over berth in the East Division are still in play heading into Week 19. Behind Calgary were Saskatchewan (10-6), Winnipeg (9-7), Edmonton (8-8) and B.C. tightly bunched. Saturday's game was the final regular-season appearance at McMahon for Buono, who has declared his 25th season as a CFL head coach will be his last. The 68-year-old won three Grey Cups with the Stampeders when he was their head coach from 1990 to 2002. A video tribute to the winningest coach in CFL history preceded Saturday's game. "I thought that was very touching," Buono said. "We're the enemy, I know that, but it was nice to be acknowledged and appreciated. "I have a lot of fond memories here as a coach. As a visitor not too often." Tyrell Sutton scored a pair of rushing touchdowns and compiled 106 yards on 22 carries in his Lions debut. B.C. acquired the running back in a Sept. 25 trade with the Montreal Alouettes. Ty Long kicked field goals from 40, 27, 52 and 39 yards for the Lions. Chris Matthews and Markeith Ambles had touchdown catches for Calgary. Ambles also had a two-point convert pass. Calgary kicker Rene Paredes was good from 38 and 35 yards in front of announced 23,563 at McMahon Stadium. The Stampeders briefly led 21-20 in the third quarter before B.C. pulled ahead again on a pair of Long field goals. Calgary's drive late in the fourth quarter stalled on B.C. 's 27-yard line, where the Stampeders turned the ball over on downs. 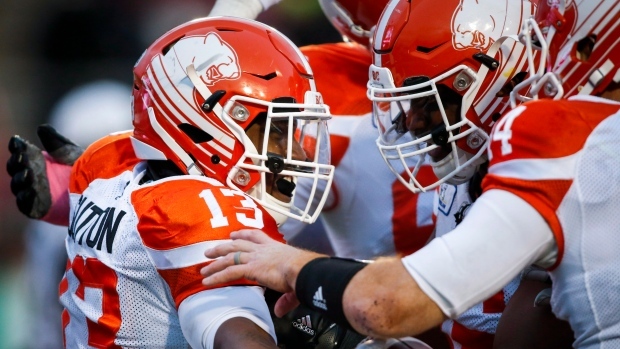 "We're not clicking on many cylinders at all right now," Calgary head coach Dave Dickenson. "We've got a lot of improving that needs to be done. "We've got a good record, but other than that, we've got to be a lot better than that. A lot of people taking selfish penalties and way too many penalties as a whole. "A lot of it falls on the offence and I'm responsible for that, so I've got to make sure to do a better job." Lions quarterback Travis Lulay, making his first start since Sept. 14 because of a shoulder injury, completed 14 of 26 passes for 193 yards. He was intercepted once. "If you can win in this building, you can win anywhere," Lulay said. "The challenge going forward is to not to feel too good about it. We've got some huge games going forward." Calgary's Bo Levi Mitchell completed 17 of 38 passes for 215 yards and was picked off once. Lulay hadn't reached his second birthday when Hagler and Hearns fought at Caesar's Palace in Las Vegas. He understood why Buono wanted the Lions to watch it though. "Shoot, I'll watch it every week if it means winning, right?"